A busy month of programs and events celebrating and supporting New Canaan Library's town-wide read of Joshua Davis’s Spare Parts wraps up with a festive evening of traditional Mexican dance and music. Join the fun on Thursday, March 28 at 6:30 p.m. in the Adrian Lamb Room. Please register online at newcanaanlibrary.org. Experience the rich music and dance traditions of Mexico’s diverse cultural history, interpreted through the artistic vision of Calpulli Mexican Dance Company. The company will present performances unique to the different Mexican states. 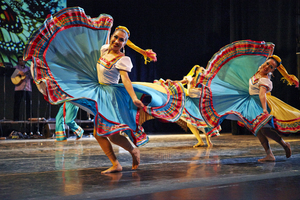 Calpulli Mexican Dance Company’s mission is to celebrate the rich diversity of Mexican and Mexican-American cultural heritage through dance-based programming including live music. Calpulli celebrates the rich dance and music traditions of Mexico’s diverse cultural history interpreted through its unique artistic vision. The fresh, vital repertoire honors Mexico’s past and Mexican-American cultural expression in the United States.